Railpictures.ca - Stephen C. Host Photo: With a limestone church (now a hall) in the namesake town of Limehouse, and with quarries all around the area, one can tell what was the rich resource that built the town of Limehouse now just a stones throw from sprawling Georgetown. Fall colours were in rich bloom as VIA 87 passes through, mimicing the yellows of foliage with their Via 150/40th anniversary paint scheme. | Railpictures.ca – Canadian Railway Photography – photographie ferroviaire Canadienne. Caption: With a limestone church (now a hall) in the namesake town of Limehouse, and with quarries all around the area, one can tell what was the rich resource that built the town of Limehouse now just a stones throw from sprawling Georgetown. 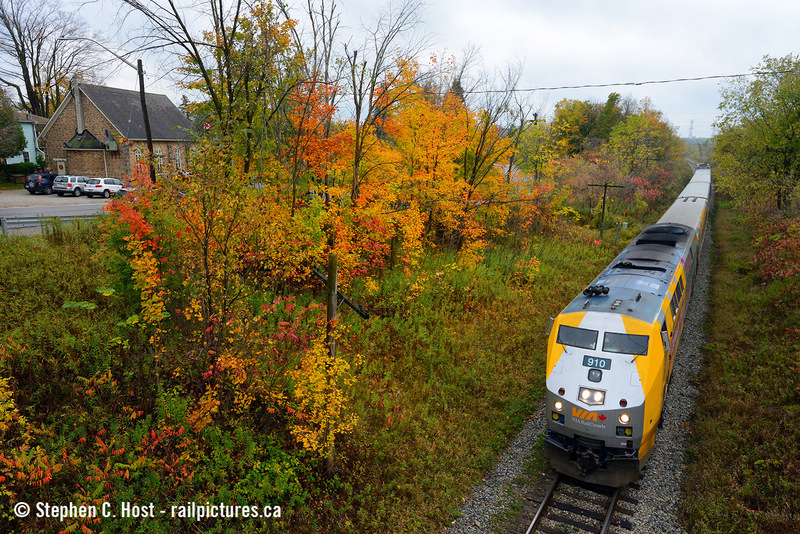 Fall colours were in rich bloom as VIA 87 passes through, mimicing the yellows of foliage with their Via 150/40th anniversary paint scheme.